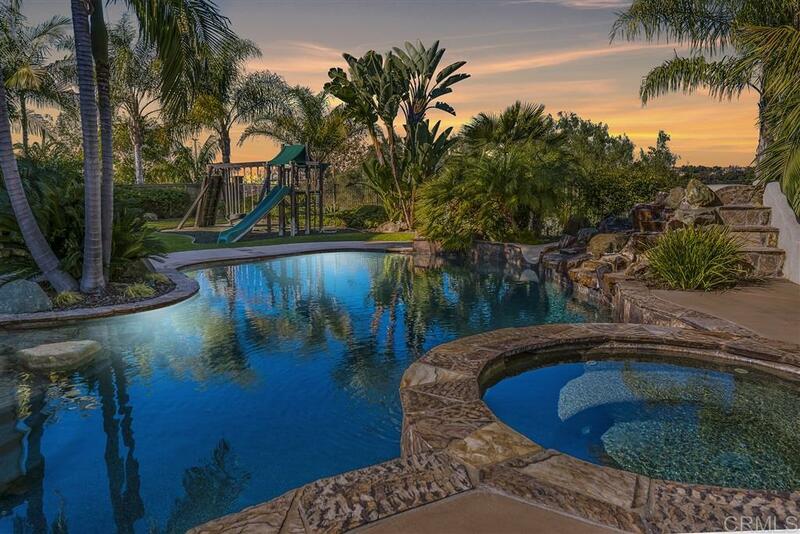 Impeccable & highly upgraded La Costa Oaks home w/gorgeous views from the tropical oasis inspired yard. No expense was spared in the creation of this luxury estate. Features: gourmet kitchen w/high-end SS appliances & granite counters, formal living & dining rooms w/double sided fireplace, 1st floor bed w/en-suite, master retreat w/bonus room & view-balcony, 1st floor office/den, dual 2 car garages, entertainer's dream yard w/pebble-tech pool w/waterfall & slide, spa, built-in BBQ, fireplace + much more!, Once you step foot in this stunning home, you're sure to be impressed at the attention to detail & exquisite finishes thru-out. You can be sure to find a moment to relax in the light & bright living room. The dining room is sophisticated, yet welcoming & is complete w/a double-sided fireplace that connects the living room. As you move into the kitchen, it's clear this space was built w/the intention to host & entertain guests simultaneously w/the family room being just steps away. Granite countertops & stainless steel appliances compliment the cherry wood cabinetry. There is a bedroom w/en-suite bath (perfect for guests), as well as a large office w/french doors to the courtyard. Upstairs features the expansive master suite complete w/stunning canyon/hill views, a bonus room w/another double-sided fireplace (perfect for a nursery, office or gym) & private balcony. The spa-like master bath offers separate vanities, center soaking tub, walk-in shower & huge walk-in closet. Each of the additional 2nd floor bedrooms has their own en-suite bath. The backyard is your very own tropical paradise surrounded by lush landscape & neighboring hills. The pebble-tech pool has a beach entry & also features a spa w/waterfall, as well as a slide w/rock waterfall. Enjoy the cozy outdoor fireplace & entertain on the built-in BBQ bar area complete w/smoker & burner. There is also a large grass area w/play-set as well as an oversized side yard w/artificial turf. La Costa Oaks features 2 community pools, spa, fitness room & clubhouse/rec center. Great school district (Oak Crest MS, La Costa Canyon HS) & amazing location close to parks/trails, multiple shopping centers, resorts & beautiful Encinitas/Carlsbad beaches.